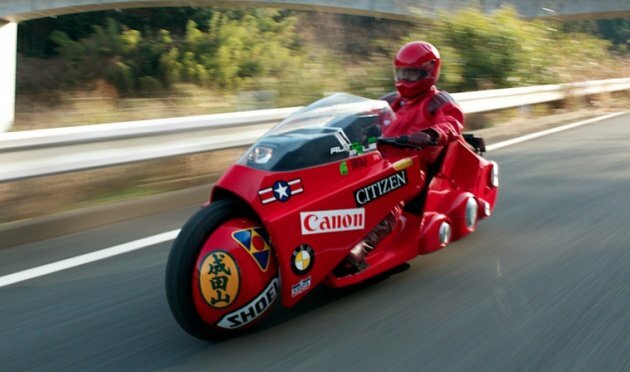 Superfan builds working 'Akira' motorcycle, ‘Akira’ superfan builds iconic bike for charity, The iconic red bike from the classic anime film took more than seven years to build. Ever thought of taking a rip-roaring road trip to Neo-Tokyo on the back of a futuristic motorcycle? Inspired by post-apocalyptic anime smash Akira, Japan native Masashi Teshima has done just that, and in the process turned his fan-fueled dreams into a platform for a worthwhile cause or two. Aboard a life-size replica of the iconic motorcycle ridden by Akira protagonist Shotaro Kaneda, Teshima set out from his hometown of Fukuoka, Japan and rode all the way to Tokyo, raising money for Bokura Company, an organization whose focus is to provide support for childhood autism. But the giving doesn't stop there. The motorcycle, which took Teshima over seven years and 10 million yen ($121,000 USD) to build, is currently on display at the Katsuhiro Otomo GENGA Exhibition, a celebration of original artwork by the acclaimed Akira creator. Proceeds go toward support for relief and rebuilding efforts stemming from the 2011 Tohoku earthquake and tsunami, which devastated large portions of Japan's east coast. Running from April 9 to May 30, the exhibition gives fans a chance to don Kaneda's red biker gang racing jacket, take pictures, and even sit on the bike -- the only one to receive the official blessing of Otomo himself.